We’re excited to announce that On The Scene has been recognized in BizBash’s first ever #BizBash500! This list of The Top 500 People in Events features leaders in every single aspect of the industry – from agencies, event planners, and event management to catering, entertainment, and event tech. According to BizBash, the event professionals on this list “represent the best of the meeting and event industry across North America,” and are game-changers. We are incredibly proud of our Managing Partner, John Stachnik for being named as one of the top 500 people in the events industry, under the Event Management category. As David Adler, the C.E.O. and Founder of BizBash noted, the list could have featured 5,000 professionals – that’s how great the industry is! John has been managing the OTS team for over a decade, and through his leadership, we continue to be a top event management company in the United States. John’s focus has always been on creating lasting impressions for each and every client, regardless of size or scope, and that’s the driving principle behind every event we produce. On The Scene is honored to be featured on this list and recognized for our commitment to producing one-of-a-kind event experiences. When you partner with the OTS team, we become your behind the scenes partners, working as an extension of your team to handle every aspect of your event – from the initial logistics to decor to transportation and even entertainment! Thank you to BizBash for recognizing OTS as industry leaders. 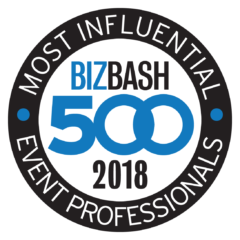 Visit BizBash’s website to check out the Top 500 People in Events and look out for it in the 2018 Holiday/Fall Venues issue of BizBash Magazine.